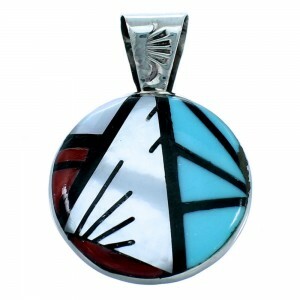 This is a wonderful piece of Zuni artistry! This piece of Native American jewelry is Zuni hand crafted by artist C.H. 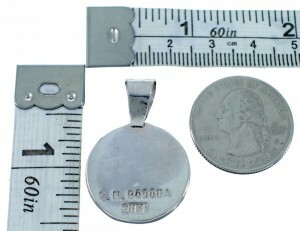 Booqua, out of genuine sterling silver and real multicolor inlay. The inlay consists of: Turquoise, Coral, Jet, and Mother of Pearl. The inlay is delicately set, creating traditional designs while stamped patterns add style for a stunning look. 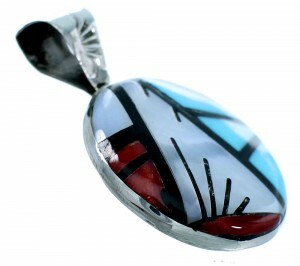 The pendant is stamped Zuni and is hallmarked by the artist.